Employees not hired through eRecruit (including faculty). New employees who need uniqnames before they complete the hiring process. Temporary staff members who did not get a uniqname when they were hired (that is, those hired before June, 2011). What Does a Sponsored Employee Receive? People who are sponsored by their department as either Incoming Faculty/Staff or Temporary Staff in the MCommunity Sponsor System automatically receive all Standard Computing Services except printing. They receive printing when they get a faculty or staff affiliation listed in MCommunity—usually on their first day of work. 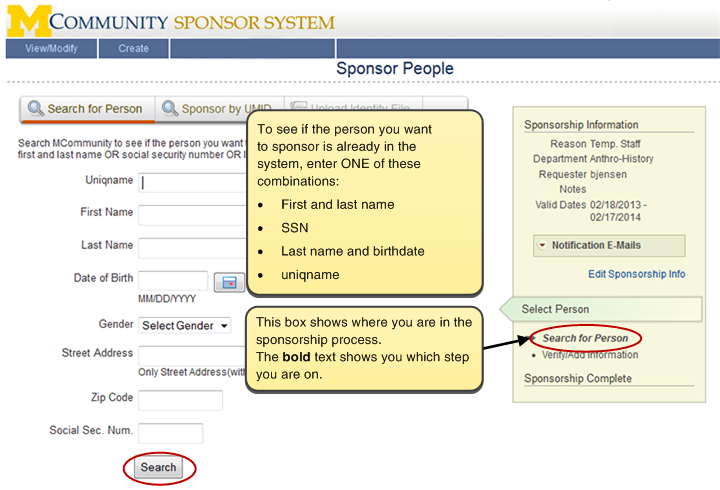 You can set up sponsorships yourself, if you are a sponsorship administrator. 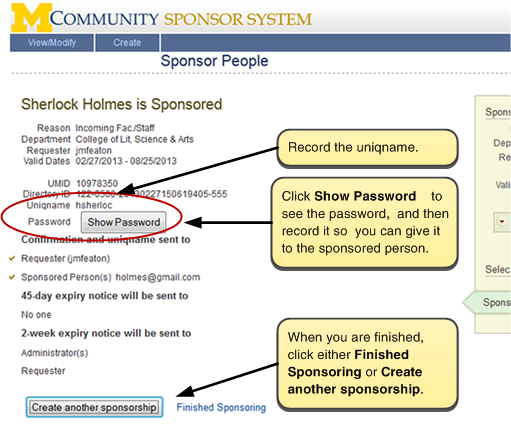 You can then use the MCommunity Sponsor System to set up the sponsorship following the instructions below. You can request sponsorships on behalf of your unit for the purpose of university business or activities if you are a regular (not temporary) staff/faculty member. Ask your unit's sponsorship administrator to set up the sponsorship for you. If you do not know who your unit's sponsorship administrator is, you can ask the ITS Service Center to let you know who it it. If your unit does not have a sponsorship administrator, you can use the online MCommunity Sponsorship Request form. 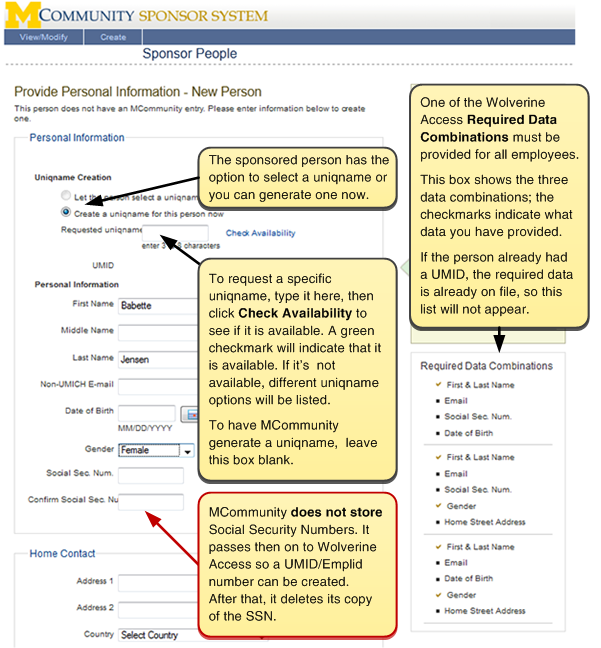 Log in to the MCommunity Sponsor System using your uniqname, UMICH password and two-factor authentication. Tip: For best results, we recommend that you use the Firefox web browser. Note: You must be on a U-M network to log in. If you need to connect from off-campus or via wireless, you can do so by using the U-M Virtual Private Network (VPN). Click the Create tab in order to see the Sponsor People box. In the Sponsor People box, fill in the appropriate information. Select either Incoming Faculty/Staff or Temporary Staff from the Reason pop-up menu, fill in the rest of your information, then click the Begin Sponsoring button. Important! Pay special attention to the Expiry date. The sponsorship will expire on the expiry date. The sponsored person's uniqname and password will stop working, and he or she will lose all access to U-M computing services. Sponsorships for Incoming Faculty/Staff expire in six months (sponsorship is no longer needed once the person completes the hiring process) and those for Temporary Staff expire in one year—unless you change the expiry date. You can extend the sponsorship at any time, up to a maximum of one year, as long as it has not yet expired. Click the Sponsor by UMID tab. Type in the UMID and click Search. If you want a specific uniqname, enter it in the Requested uniqname box, then click the Check Availability link to see if it is available. If you prefer, you can let MCommunity select one for you based on the person's name. If you let MCommunity select the uniqname, be sure to enter a middle name or initial for the person. Important! Once a uniqname is generated, it is very difficult to change. By taking the time to request a uniqname, and reviewing uniqname options with the sponsored individual if the requested uniqname is not available, you can save a lot of time and trouble. Once a uniqname is generated, it may only be changed if it meets certain guidelines. See Changing Your Uniqname for more information. 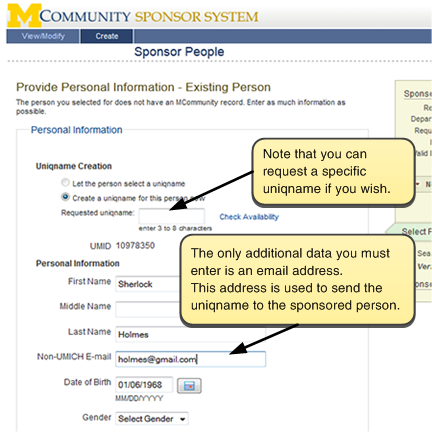 In the Non-UMICH E-mail box, type an email address at which mail can be sent to the sponsored person. When you are finished entering information, scroll to the bottom of the page and click Save Information. Important! Any information you enter or change in the Personal Information section of this page stays in MCommunity. It is not sent back to Wolverine Access. 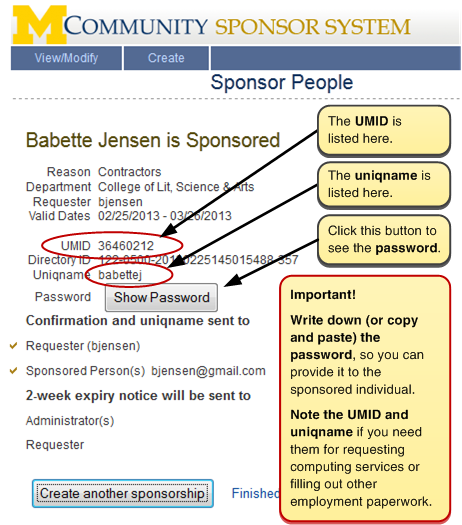 On the confirmation screen, click the Show Password button to get the sponsored person's UMICH password. It is your responsibility to get the password to the sponsored person. See Communicating and Resetting Passwords for Sponsored People for details. Important! In the event of a forgotten password: If you forget to get the password on this screen, the sponsored person will need to contact the ITS Service Center to get it reset. Note: You must signed into a U-M network to login. If you need to connect from off-campus or via wireless, you can do so by using the U-M Virtual Private Network (VPN). In the Sponsor People box, fill in the appropriate information. Select either Incoming Faculty/Staff or Temporary Staff from the Reason pop-up menu. When you've entered all your information and selected the notification emailsyou want sent, click the Begin Sponsoring button. Important!Pay special attention to the expiry date. The sponsorship will expire on the expiry date. The sponsored person's uniqname and password will stop working, and he or she will lose all access to U-Mcomputing services. Sponsorships for Incoming Faculty/Staff expire in six months (sponsorship is no longer needed once the person completes the hiring process) and those for Temporary Staff expire in one year—unless you change the expiry date. You can extend the sponsorship at any time, up to a maximum of one year, as long as it has not yet expired. You'll be prompted to search MCommunity to see if the person you want to sponsor is already in a U-M system that connects to MCommunity. Enter as much information as you can to help you in your search. Important! If the person already has a UMID or uniqname, it is essential that you find them and sponsor them using their existing online identity rather than creating a new one; otherwise, you could end up with two UMIDs, two entries in Wolverine Access, or other situations that lead to chaos and confusion for the sponsored person until the duplications are manually cleaned up. See Tips for Searching the System to Prevent Duplicates in Using the MCommunity Sponsor System Via the Web for search tips. If there are no matches, click Add a New Person to continue. If you get one or more matches, you can click the blue i button to the far right of each match listed to see more information about the match. Use this information to determine if one of the entries listed is the person you are trying to sponsor. 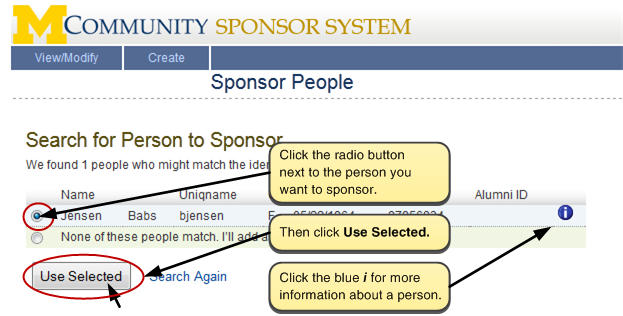 If you find an entry for the person you want to sponsor, select it by clicking the radio button next to it, then click Use Selected. Next, enter the required information about the person you wish to sponsor. For employees, you will need enough information to create a Wolverine Access entry. If you selected an existing identity to sponsor, much of this information will already be filled in for you. Scroll down to the bottom of the window, and click the Add Person button. You will see confirmation that the individual is now sponsored. Important! Be sure to write down, or copy and paste, the password. This is the only opportunity you will have to do so. If you see a Show Password button for someone who already had a uniqname before sponsorship, it means their password was reset and that you'll need to give them their new password. This happens when someone whose uniqname was inactive (a terminated staff member, for example) is sponsored and their uniqname is reactivated. If you do not give the sponsored person their password, they will need to contact the ITS Service Center to get it reset. Important! Note the UMID and uniqname for your records if you will need them for requesting computing services or filling out employment or other paperwork. It is your responsibility to convey the password to the sponsored individual in a secure manner. The initial password, because it is generated randomly, will be difficult to remember. Please direct the sponsored person to the Change UMICH Password page, where they can change it to something that will work better for them. Click Finished Sponsoring to return to the Sponsor System home page. Or, click Create another sponsorship if you want to sponsor another person. If sponsored people need a printing allocation, departments can request this by using the Request an Account tab on the Print Account Provisioning page. Incoming faculty and staff members will transition from being sponsored to being regular members of the university community when they complete the hiring process and have an entry in Wolverine Access as faculty or staff. After this happens, the person no longer needs a sponsorship. The sponsorship can be allowed to expire with no ill effects. As a faculty or staff member, the formerly sponsored person will continue to receive standard computing services. If the incoming faculty or staff member does not complete the hiring process within six months, you will need to extend the sponsorship to avoid termination of computing services. See Extending a Sponsorship below. Temporary staff members will retain use of their uniqname and computing services for as long as they remain a university employee (whether they remain temporary or become a regular staff member). The sponsorship can be allowed to expire with no ill effects. Non-student temporary staff who are hired through eRecruit get a uniqname during the hiring process. If a non-student temporary staff member is hired outside of the eRecruit process, the person can be sponsored to get a uniqname. To extend a sponsorship, change its Expiry date. You can contact the ITS Service Center and ask for a sponsorship extension, or you can do it yourself using the MCommunity Sponsor System if you are a sponsorship administrator. Log in to the Sponsor System. You will see a View and Modify Sponsorships screen. 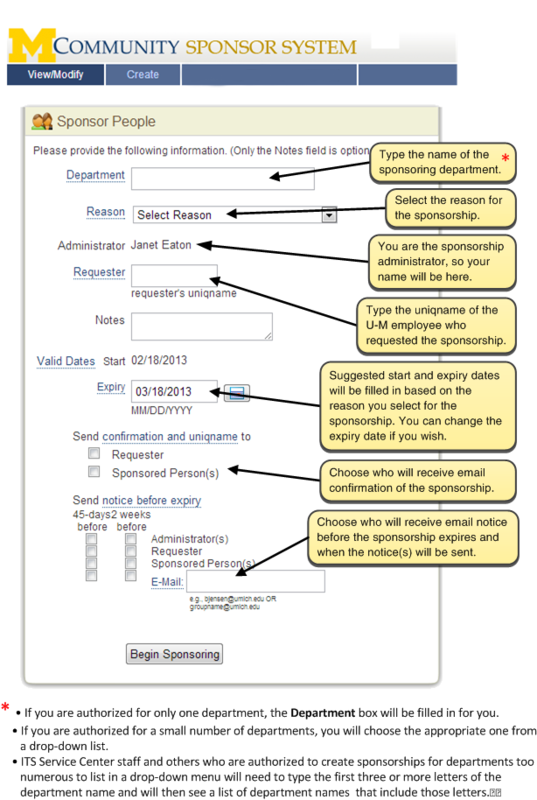 From this screen, you can update the expiry date of one or more sponsorships and edit individual sponsorship entries. 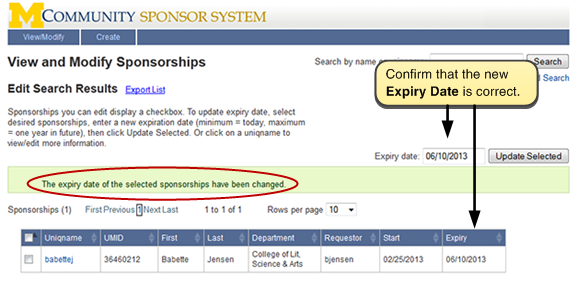 To change the sponsorship expiry date, select the checkbox of one or more sponsorships. Then enter the new expiry date and click Update Selected. You will see that the Expiry Date has been changed to the new date you entered. Confirm that the new Expiry Date is correct. 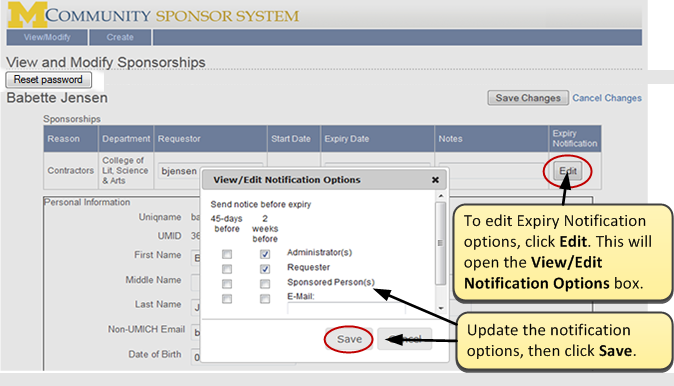 To view or change sponsorship Expiry Notification settings for a sponsorship, click the uniqname of the sponsored person. To edit Expiry Notification options, click Edit. Update the notification options, then click Save. Important! Click Save Changes when finished.